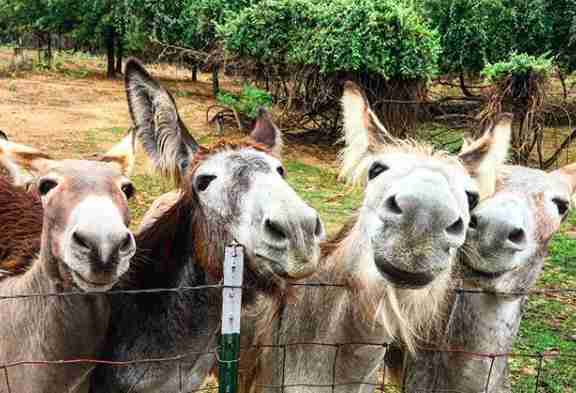 "Each donkey waits their turn for a hug. It is the sweetest." 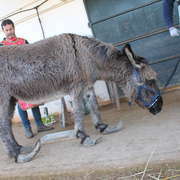 It’s an unfortunate fact that donkeys across the world suffer from an unfair reputation. Many people think the animals are only really good for hard work, and yet, on the other hand, the animals are also known for being terribly stubborn. Yet some people still have the openness to see donkeys for what they really can be: caring individuals who can be very loyal members of the family — if only given the chance. One such person is a little girl named Honor. Her parents recently started Sycamore Tree Ranch, a sanctuary for needy animals in Springtown, Texas, and so she has the happy privilege of growing up around so many of these special individuals. 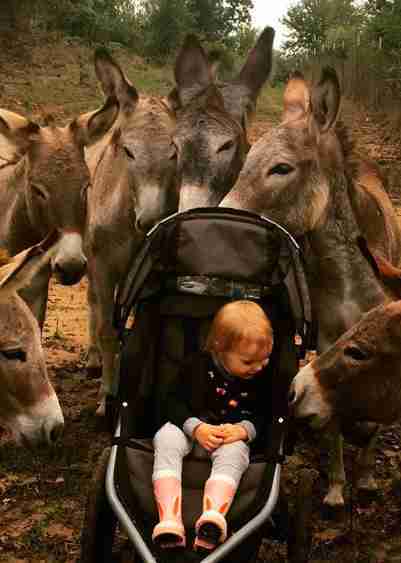 Recently, on the family’s evening walk, which they take with their rescued donkeys, it was clear that Honor was fascinated by the “stubborn” rescued animals — and the donkeys definitely seemed to notice her openness to them. 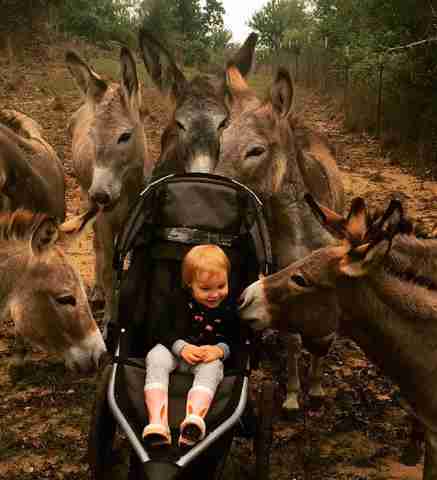 “She is obsessed with the donkeys,” Koby Wegge, cofounder of the sanctuary, told The Dodo. And this kind of relationship is exactly why Wegge and her husband, a U.S. Air Force veteran named Chad, started the sanctuary in the first place: They want to offer animal-assisted therapy to people suffering grief and trauma. So not only are they saving lives of animals — they also want to give something priceless to human beings, too. Most of the donkeys at Sycamore Tree Ranch were saved from “kill pens.” Kill pens are places unwanted farm animals end up before they're shipped to Canada or Mexico for slaughter. 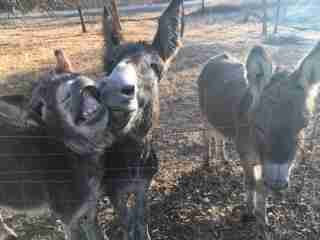 "All of our donkeys (with the exception of a couple of owner surrenders) were all saved from kill pens," Wegge said. On one trip to the kill pen, Wegge planned to save just one donkey: "We came home with four," she said. "When we first got them, they were so terrified of people that we couldn’t get even close to them," she said. "It took about six months of patience and perseverance but now (as you can see) they are so friendly. " Now the whole family takes evening walks with their rescued donkeys, who follow closely behind them, clearly feeling safe and loved in their new home. A few cats, dogs and horses also come along for the outing. 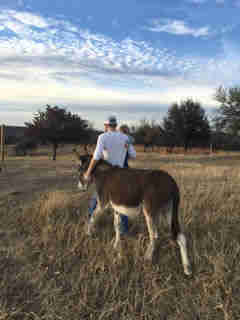 "We like to walk our property as many evenings as we can and discovered that the donkeys love to join, too," Wegge said. "There’s also always our dogs that join us and a few cats, too. And sometimes even the goats like to come along!" The donkeys at the sanctuary are naturally curious, and love to explore. And when Honor comes along on the jaunts, they are especially interested. 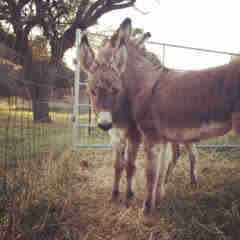 "When we are on our walk, each donkey waits their turn for a hug. It is the sweetest," Wegge said. "They have come so far." You can help this sweet herd of rescued donkeys and all the other animals at the sanctuary by making a donation.